Everything is NOT destined to become a classic. Some Chefs, & home gourmets, live and breathe by the classics & other run fast & far from them, wanting to create only the latest culinary crazes to amaze & dazzle their crowds … but it’s all good I say!! We need excitement, spice & variety in life. Me, I too love trying new techniques & cooking up the latest recipes from Savuer’s pages – sometimes. However, these days I tend to pull the classics close & bask in their comfort, warmth & their “hey, I know you” familiarity! At this point in my life journey, I subscribe to the thought process that we all need more ‘feel good’ in our life, right? I won’t say that I always stick to the exact recipe but I also don’venture far from the beaten path either. Sometimes, that (little) personal tweak is what makes it feel like mine, for me but also for those I cook for frequently. It’s just artistic license with food. My final thoughts on this subject have me wondering what is the ‘magic formula’ for something becoming a classic? By definition classic is an “…outstanding example of a particular style; something of lasting worth with timeless quality; of the first or highest quality, class or rank…” Thus, for food at least, I simplify this to mean “don’t get crazy” (I just heard Bon Qui Qui in my head too). 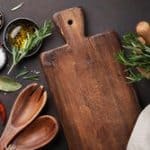 It means good, real, attainable ingredients prepared in a realistically practical way. Honor the food my friends; that’s what classic is all about! 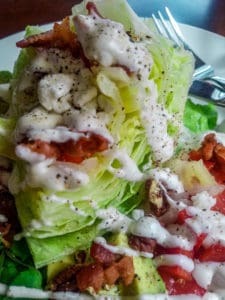 So now, for one of my favorite classics (in the salad category at least), I give you —> The Wedge Salad. My take on this time-honored classic. I take a few (small) liberties but mostly I stick to the basics! 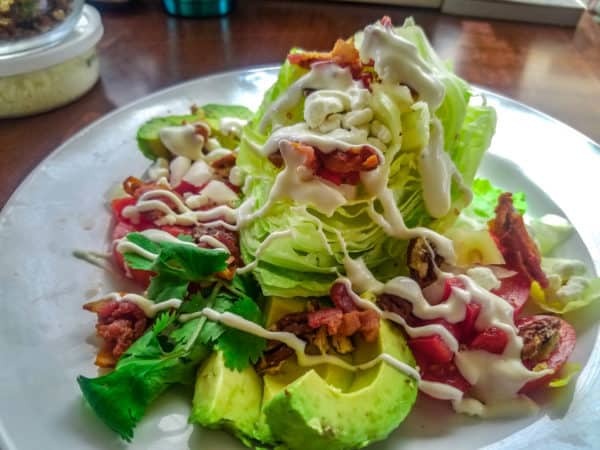 Enjoy this salad as a meal alone or as a great accompaniment to a steak dinner! Noteworthy point -- serve it COLD ... for some reason it's just better! 1 head iceberg lettuce Yep, just the iceberg & fight the urge to buy bib! To my beginning point of serving it cold, when possible, if you stick to my guiding principle of 'mise en place', then you will prep ahead, refrigerate all parts for at least 30 minutes & then assemble to serve fresh. But, I won't lie, it's delicious no matter what! TO START-- Crack the head of LETTUCE on the counter, core side down. Now remove the core. Easy, huh? Peel away the first (flimsy or dirty) outer leaves. Cut the head in half & then half again, leaving you with 4 wedges. Run under cool water & gently shake. I then lay them on a clean towel (or paper towels) to dry while I prepare the remaining parts. Cut up TINY TOMATOES (however you like). I like a dice for half & just halved for the rest. You get some pieces that cling to the wedge that way & some that are pretty on the plate. Cut GREEN ONION. I go fairly thin & don't use the top quarter or the whitest parts for this. Previous Post “Oven Roasted Tiny Bites of Tastiness” Brussels Sprouts for All!